In the run-up to Independence, the Barotse wished their country NOT to be included in Zambia. They wished to retain their Protectorate status. A delegation flew by Comet to London for talks with the Commonwealth Office. 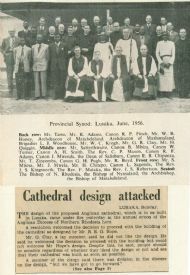 The delegation comprised the Paramount Chief (Litunga, Sir Mwanawina Lewenika III), the Prime Minister (Ngambela), the Heir Apparent (Mwana Mulena Sii-Sii) and the Privy Council (about a dozen senior Indunas), and the delegation was accompanied by Her Majesty's Resident Commissioner for Barotseland, Gervas Clay. We left Mongu by Dakota on the 4th April for Lusaka, and the Paramount Chief, Ngambela, Mwana Mulena Sii-Sii and myself stayed at Government House while the rest of the party stayed at Longacres. For the last night the Paramount Chief, the Ngambela and Mwana Mulena Sii-Sii went to Highlands House. Time was spent in arranging for Travellers' Cheques etc., and there were no official talks or discussions. When I asked the Paramount Chief how much money he had in cash as he would only be permitted to take £10 out of the Federation in cash, he said that he had got more than this sum. I then asked him directly how much more he had got, he confessed that he did not know exactly, but thought it was about £1,000. At a later stage the Private Secretary might have been seen, I understand, crawling about the Paramount Chief's bedroom sorting vast quantities of very dirty 10/- notes which were spread all over the floor. Eventually the money was banked to the tune of £1,030 and Travellers' Cheques for £500 were made out in the names of the Paramount Chief and Sii-Sii. The Paramount Chief obviously did not like having half his money in the name of his son, but this was the only way to make it available in England owing to the finance control restrictions. 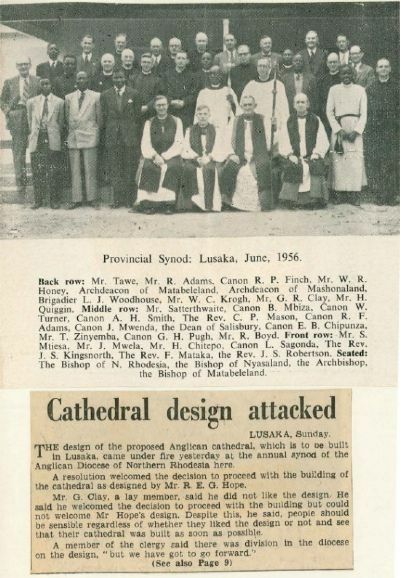 We left Lusaka on Friday evening and found that Kaunda was to be on the same plane to Salisbury as he was proceeding to America. There was a con­siderable party of Africans to see him off and they were singing songs etc. Once we were in the plane the Paramount Chief asked me to sit beside him as, by custom, none of his people could sit along side him, and it was therefore my fate, throughout the air travel to and fro, to sit on the inside while the Paramount Chief looked out of the window. As soon as we had sat down in the aeroplane Kaunda arrived and asked the Ngambela, who was sitting on the opposite side of the gangway, if he might speak to the Paramount Chief. He then went down on his knees in the plane and clapped his hands to the Paramount Chief while I sat between the two protagonists. 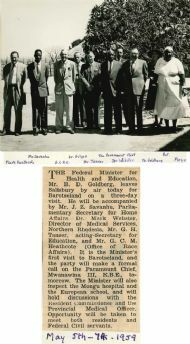 On arrival at Salisbury we were met by Owen, the Minister for Home Affairs in the Federal Government; Kenny, a Northern Rhodesian Labour Officer: and Commander Michell, Controller of the Governor General's Household, and we were taken to a private V.I.P. lounge where drinks and snacks were laid on for us. There were a considerable contingent of pressmen present but they appeared not to have got any change out of the Barotse. 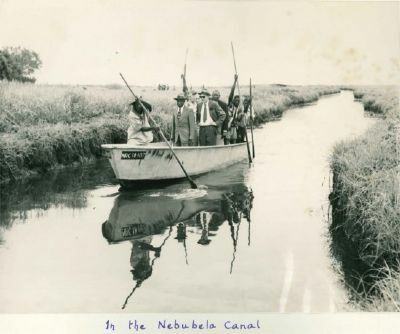 We then entered the Comet and the Paramount Chief and myself sat in the front seats in the first class with the Ngambela and Sii-Sii in the left-hand front seats. The rest of the party were in the middle of the tourist accommodation and were all sitting together. The Paramount Chief, after a little nervousness when we first left Mongu, had been very much enjoying his flight, asking a continuous stream of questions and picking up landmarks on the ground. We reached Nairobi at about 11 p.m. and were met by the Federal Govern­ment's Commissioner to East Africa, and a representative of the Chief Secretary (who was I believe a retired Provincial Commissioner). Again we were given V.I.P. treatment with refreshments laid on. On arrival at Khartoum of course there was no one to meet us, and we went into the public lounge. One of the other passengers came up to me and explained that he was a journalist on the staff of the "Bulawayo Chronicle" going home to England on leave, not on duty. He said he had noticed that Kaunda was travelling with the Barotse delegation and asked me what the significance of this was. I told him that it had absolutely no significance whatever. We left Khartoum about mid-night and an hour and a half later, when we were all either asleep or dozing, the lights in the plane were all switched on and the Captain of the aircraft announced that he had feathered one of the engines as there was some trouble with it, and was turning round and returning to Khartoum immediately. The "No Smoking" notice was then put up and kept up until we got to Khartoum. Having got back there we spent two hours waiting on the ground after which we were able to proceed. We duly arrived safely at Rome and again had an hour's wait. Ten minutes before the plane was due to leave the Paramount Chief demanded to be taken down to the ground and departed for the lavatory. Just as he disappeared out of sight the call went out for all passengers to go to the aeroplane. Despite much shouting and running to and fro, nothing would induce the Paramount Chief to come up until he had done what he had gone down for. Meanwhile excited Italian officials ran to and fro demanding that I should lead my party on to the plane. However, the Malozi, with their traditional courtesy, resolutely refused to move until their Paramount Chief was ready to lead them back to the aeroplane. After some twenty minutes the Paramount Chief re-appeared, and moving with the utmost slowness and dignity proceeded down the ramp, egged on by Italian officials, and eventually boarded the plane to the great amusement of its crew and passengers. We were by this time, of course, running four hours behind schedule. We had magnificent views of the snow-covered mountains of the Alps but then entered cloud and saw nothing of the French countryside, of the Channel, or of the English countryside after crossing the coast. We eventually came out of cloud at a very low level just before landing at London Airport and this, I think, frightened the whole party. It was a very cloudy, rather cold day when the plane touched down. The Shaftesbury Hotel is in Monmouth Street, not far from Leicester Square. On arrival it was found that the party were in rooms on five floors of this hotel. The rooms were exceedingly small, and the Paramount Chief took one look at his and refused to enter it. Adams was able to sort this out and got him into a double room which he was prepared to accept, although even this was exceedingly small. We were also, by more juggling, able to get the Private Secretary, Kuongo, fairly close to the Paramount Chief's room. Arrangements had been made for us to go to the London Planetarium at 5.30 p.m., but this was cancelled by mutual consent as we were all tired and did not wish to turn out again that evening. Next morning the whole party went to Matins at Westminster Abbey. It was comparatively easy to get taxis at short notice, but by law taxis can only carry four passengers. Although nearly all drivers were prepared to take five, every now and then one proved difficult and would only take four as a result of which we had to have a fourth taxi. On this occasion one taxi arrived at the Abbey door before we did, and when the paramount Chief got out the five members already there prepared to go down on their knees and clap their hands to him, but the Paramount Chief at once said they need not do this which set a useful precedent. the Paramount Chief was most reluctant to go anywhere unless he had either Adams or myself with him. I should mention that when we went in taxis the Paramount Chief always insisted that I should sit next to him and that only Sii-Sii could sit on the other side of him, so that I invariably had to sit in the middle on all motor journeys. In the afternoon we set off for Hampton Court where my Mother-in-law, Lady Baden-Powell, has a "grace and favour" apartment and had invited us all to tea. She had six other guests to entertain us and the party went extremely well. Kuonga, as a Scouter, was in his element shaking hands all round with the left hand. 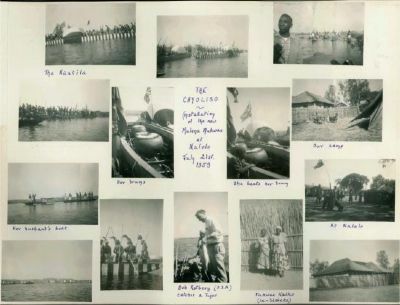 That evening Induna Muyunbana came down for dinner in the dining room of the hotel in full Barotse costume wearing a sitziba, a coat with a scarf swathed across it, and the red beret worn by the Paramount Chief's paddlers. This caused something of a sensation in the hotel, and I am sure most of the diners thought he was the Paramount Chief. On our return to the hotel Sii-Sii came to me and said that the Paramount Chief wished me to go and see him as he wanted a drink. I suggested that he should get his father a drink but he said no, his father wanted to see me. When I went up I found that the hotel was only licensed to have a bar downstairs and were not allowed by law to serve drinks in the bedrooms. I was able to get a porter to go out and get a bottle of Sherry and sent that up for the Paramount Chief, and this solved the problem for the rest of the visit, during which the Paramount Chief never had any meals at the hotel out of his own room, and never had a drink at the bar. Adams came round in the morning and paid each member of the party his allowance for five nights at £7 a night, and I am sure several of them had never owned £35 in cash before in their lives. They very quickly found that they could get cheaper meals outside the hotel and were determined not to pay 12/6d for lunch and 14/6d for dinner. All of them, I think, paid their Bills in advance and then went off happily to spend the balance on warm clothes, coats, bowler hats and presents for their wives and children. At 2.45 p.m. 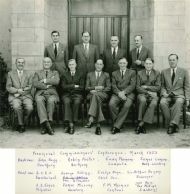 I went to the Colonial Office for talks with Watson, and Eldridge joined us there. Later Mr. Thomas, the Minister, arrived having come almost straight from the plane. At 6.15 that night we went to the Victoria Palace to see "The Crazy Gang". What the Africans made of it I have no idea, but almost the first scene was a fireman in his tunic but no trousers, in a large double bed with an attractive girl. A series of telephone calls kept on coming in about fires, and eventually one to which he replied, that it was nothing to do with him, but a matter for the Police. At that moment a Policeman clambered out from under the bed also with no trousers on. I was thankful that I did not have to explain what this was all about: Most of them were also completely mystified by the activities of the beautifully trained Tiller Girls. Next morning I was told that the party was divided between those who thought they had seen some sort of puppet show and those who were confident that they had been looking at real people, however peculiar. They had obviously, all of them, immensely enjoyed the show however puzzling they had found it. I have omitted to record that on Sunday Muyumbana had a headache and was obviously under the weather. 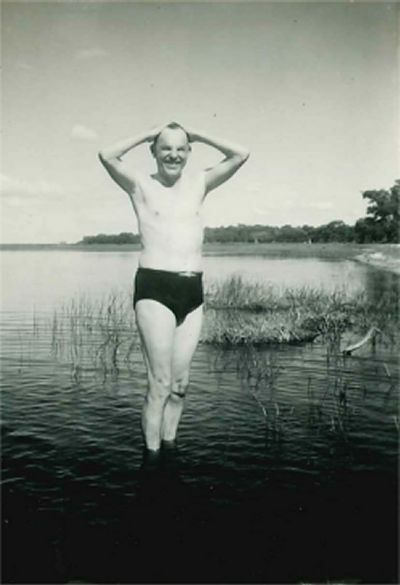 He said to me, "If there were only an aeroplane going back to Barotseland I would go on it." When I said, "Oh, don't you like my country?" he replied, "No, there is far too much witchcraft here; when I go into a house it goes up in the air." (He was referring to the hotel lift). It was interesting to note that all members of the party invariably referred to their rooms as "my house." I also noticed that many of them were calling the waiter "Sir", and that they never said either "please" or "thank you" when being waited on. I think it was on this day that when I came down at 7.30 a.m. for breakfast I found the whole party, with the exception of the Paramount Chief, sitting in the lounge. The Ngambela came over to me with a very worried face and said that a terrible thing had happened. He told me that a very important gentleman from a very important newspaper called "The Times" had asked for an interview. The Ngambela had said that they had a very tight programme and the reporter had replied that if the Ngambela fixed a time he would be there. The Ngambela and replied (on the telephone) that he would see him next morning between 6 and 7 a.m. and had then rung off. He explained to me that they had been waiting for this important gentleman to arrive and that he had never turned up and what were they to do. I told him that they could laugh and forget it, and that it was most unlikely that they would see him again. In fact he never turned up or got in touch with us again. At 11.30 that morning I went to the Colonial Office for more "talks" before the official talks started. At 2.30 that afternoon we went to Clarence House for tea with Her Majesty the Queen Mother. The party consisted of the Paramount Chief, the Ngambela, Sii-Sii and myself. I had previously received a message from Adams that the Queen Mother would be very glad if I went too, but only if the Paramount Chief and party did not wish to go alone. However, the Paramount Chief was always most anxious to have someone to go with him. When we arrived at the door we were greeted by Lord "X" and Lady "Y" and Martin Gilliat. Lady "Y", the lady-in-waiting, gave a delightful curtsy to the Paramount Chief. We were then taken into the drawing room where we were joined by the Queen Mother. She was her usual gracious self and remarked that she and her staff were still talking of their wonderful visit to Barotseland, and she asked us all individually to take messages from her back to Mongu. We then had tea. The Queen Mother sat in one corner of the room with the Paramount Chief; Sii-Sii sat in another with the lady-in-waiting; the Ngambela sat in a third with Martin Gilliat and I sat in the fourth with the other equerry. In due course Sii-Sii was taken up to the Queen Mother's table and then I was taken up too in his place. The Ngambela was not so taken up and I think cumulatively resented the fact that everywhere precedence was given to Sii-Sii which, by their custom, was entirely incorrect. On leaving Clarence House we, all of us, signed the book. At 11 a.m. the "Talks" started with the Secretary of State. At 12.20 a car arrived from Buckingham Palace with one of the Queen's Equerries to collect the Paramount Chief. To everyone's surprise the driver of it was a woman. The Paramount Chief had been told that he should go either in robes or in a morning coat. Be had, therefore, attended the "Talks" in a morning coat and went off to Buckingham Palace with the Equerry and no one else. He was duly "dubbed" by the Queen and had half an hour's private conversation with her with no one else in the room. He was then brought back to the hotel in the same car. At 4 p.m. we went to the Houses of Parliament by arrangement made the night before and one of the M.P.s (F. Bennett) received us there. The intention was that the Paramount Chief, Ngambela and two Indunas should have tea and talks with about fifteen Conservative members of Parliament. 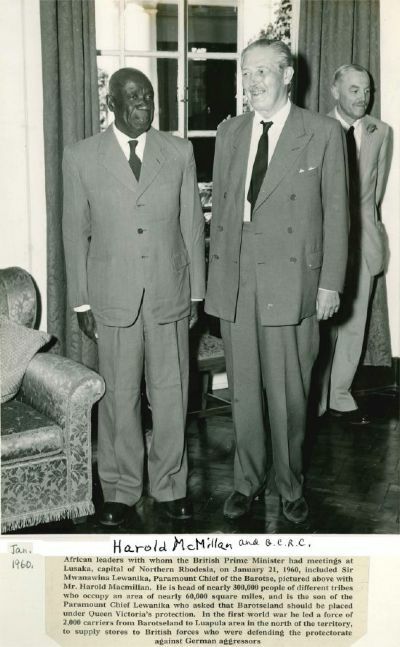 I had suggested to the Paramount Chief that he should pick two of his most intelligent indunas, such as Kalonga, Katema, Leashimba or Mukande, and that this might be a suitable opportunity to leave Sii-Sii behind as he was in on so many of the important social occasions. However, disregarding my advice Sii-Sii was duly brought along together with the Leashimba. After tea Mr. Bennett made an amusing little address, saying how grateful they were to the Paramount Chief for coming along and how anxious they were to appreciate and support his position. I looked at the Ngambela to reply, and he stood up and said, "As there is no interpreter here the Resident Commissioner will reply for us." This was done. We were then taken up to the Strangers' Gallery and listened to a debate for some time. Fortunately the debate was one which was of general interest as it concerned the question of whether men between the ages of 18 and 21 should be hanged for murder. One of the Labour members made a very long speech and eventually I felt it was time to go because of the difficulty we might have in getting a taxi during the rush hour. As we reached the central lobby the division bells rung and members started running in all directions. The Paramount Chief was hardly restrained from running back to see what had happened. That evening we went to dinner at the Savoy Hotel - a farewell party given by the Rhodesia and Nyasaland Club to the retiring High Commissioner Sir Gilbert Rennie. There must have been between 200 and 300 people present. I have omitted to record that Rhodesia House had rung up Northern Rhodesia House and asked that Godwin Lewanika should be booked in at our hotel. This was much resented by the Ngambela, who repeated many times that he was not an official member of the party and could not take part in the "Talks". 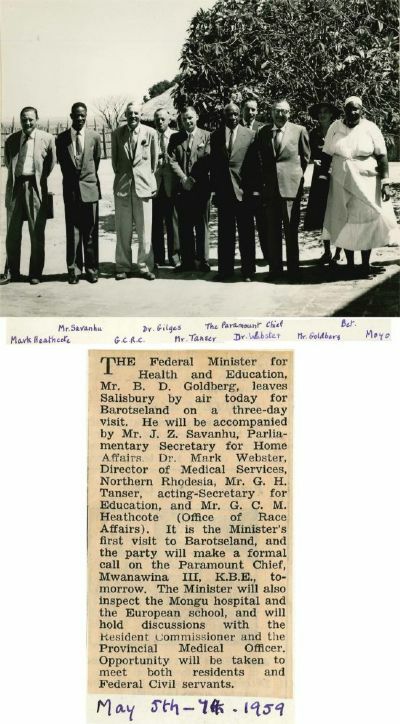 On the present occasion, as a Federal Member of Parliament, he of course was included in the party. The Paramount Chief and Sii-Sii sat at the top table. Sir Gilbert made a first-rate speech and told some very amusing stories. Immediately we rose from dinner I was informed that the Paramount Chief wished to go home. As there were many people there who wished to see him and whom I wished to see I did not take him home for some time. at 11.30 where we were received by Dr. Bennet, who was the Parliamentary Private Secretary to the Secretary of State. Two other Members of Parliament, including Sir Lionel Heald, had promised to come and take all the members around the Houses of Parliament. Dr. Bennet took five of the party, including the Paramount Chief and the Ngambela, and I waited with the other nine in the main lobby for twenty minutes before the other Member of Parliament arrived. 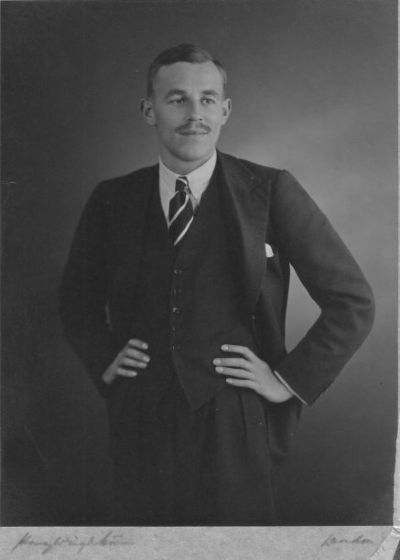 Sir Lionel Heald never arrived. We were then taken around the House of Lords and House of Commons and had everything explained to us. We were told that the House of Commons had been completely destroyed by a bomb during the war and re-built and that most of the fittings had been given by dominions and colonies. One of the Lozi members immediately asked if anything had been given by Northern Rhodesia and this, our guide was unable to answer. However, I had been taken round in the past and was able to point cut that the two copper brackets on which the Mace rests were presented by Northern Rhodesia. We were taken out on the balcony where our photographs were taken. At 12.30 in the afternoon, the whole delegation went to the Colonial Office where Mr. Thomas, the minister, had promised to give them certain explanations. When I tried to hurry Mulonda into the waiting taxi he said why had they got to go and that it was most inconvenient, to which I replied that the matter had been cleared with the Paramount Chief and I was not prepared to discuss its convenience with Mulonda. Shortly after 4 p.m. "Talks" with the Colonial Secretary continued. After returning to the hotel and having dinner, we went to the finals of the London Amateur Boxing Association Championships at the Royal Albert Hall. The Barotse thoroughly enjoyed the boxing for the first three quarters of an hour, after which they got bored and the Paramount Chief said he wished to retire. I told him he could not because his delegation was scattered all over the hall and he was very shortly laughing again at what he regarded as the antics of the boxers. However, I eventually took him away an hour before the end and the rest of the party joined us outside. One or two of the Lozi had enjoyed themselves, but the great majority did not like what they had seen and kept on asking what was the point of it. I understand that next morning Induna Katema gave an excellent exhibition of what he had seen to Adams. In the hotel the doors into the lounge were made of glass, and poor old Katema walked into them three times. The last time he raised a very large bump on his forehead and he announced that when he got back to Bulozi he would tell his friends that he had been hurt in the Boxing Championships. There were "talks" at the Colonial Office in the morning and afternoon and at 1 p.m. Mr. Thomas, the Minister, went to lunch with the B.S.A. Company Directors together with the Paramount Chief and Ngambela. They were presented with beautiful copper ashtrays with the B.S.A. Co. crest in the middle of it. 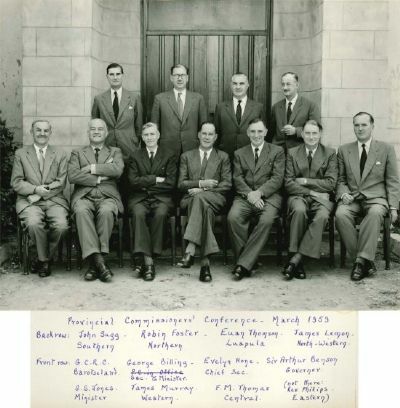 That evening at 5.30 we went to a Cocktail Party given by the Commissioner for Northern Rhodesia at which I found many old friends. As the Colonial Office only work the five day week there were no talks on this day and the party had to move from the Shaftesbury Hotel to the Green Park Hotel, which is in Half Moon Street off Piccadilly. I took the Ngambela to record a broadcast at Bush House. We had to do this twice as in the first one the Ngambela spoke much too fast. After the strain of the talks of the previous day the Ngambela had a severe neuralgia headache and did not enjoy his morning. Mr. and Mrs. Adams had taken the Paramount Chief out shopping. Earlier in the week the Paramount Chief had been to Holland and Holland where he had bought a shotgun, a rifle, some ammunition and many accessories to the tune of some £300. He had also been to Austin Read where he had ordered four suits to be made for himself. It may have been on this day that there was nearly an unpleasant incident. For at, I think, Austin Read, the party were moving down from floor to floor and asking for the goods they had bought above to be brought down to them on the next floor. When they reached the ground floor one of the shop assistants arrived with some parcels from a higher floor and announced that he had brought these down for the "wogs". Immediately umbrage was taken, but the assistant hastily explained (whether with truth or not is not known) that the expression "wogs" was always used in the shop for those who were Waiting On the Ground Floor. At 1.30 p.m. we started off in a hired car to visit Sir Charles and Lady Ponsonby near Woodstock outside Oxford. The party consisted of the Paramount Chief, Sii-Sii, Kalonga, Katema and the Leashimba. After a week in London we were too thankful to get out into the countryside and, in fact, many of the Africans had been taking a dim view of England on the grounds that it was just one town. It was a lovely English spring day and the countryside could not have looked more beautiful. Several of the party commented at intervals how beautiful it looked. We reached the Ponsonby's lovely early Georgian country house opposite the gates of Blenheim Palace at about 4 p.m., and the Barotse were immediately taken by Sir Charles to see his cattle and pigs. There were several guests for tea including Julian Evetts, who had been a District Officer at Mongu 25 years ago. After tea the Paramount Chief at once said that he wished to go home, but before doing so we were taken round the house which I think gave them much pleasure, and I am sure that this visit to an Englishman's home made a deep impression. A char-a-banc was put at the disposal of the party and they went off with Messrs. Eldridge and Adams to Brighton and the Southern Counties. They were particularly anxious to see the sea and several of them tasted it. For the party as a whole, there is no doubt that this day was the highlight of the whole visit. As it was my birthday I did not accompany them, but went off by myself to visit some of my friends and relations. There were talks in the morning and the final short session in the afternoon at the Colonial Office. Godwin Lewanika was also there. The head of the table was taken by Mr.Phillip Oppenheimer, a first cousin to Henry Oppenheimer, and head of the diamond side of the business. We had a particularly excellent lunch on the 9th floor and were able to look out over a large part of London from this viewpoint. 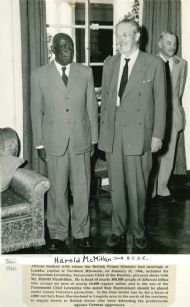 At 6 p.m. the High Commissioner gave a Cocktail Party for us at Rhodesia House and again we met many old friends. The Paramount Chief, Ngambela, Sii-Sii, Godwin and myself went in dinner jackets. We went straight on to the Dorchester Hotel to a dinner party given by the High Commissioner. There were twenty-five guests (all men) and the High Commissioner made a long speech welcoming the Paramount Chief and his party to which I replied on behalf of the Paramount Chief. Once more the Paramount Chief wished to retire immediately after dinner, but I was able to keep him at the party for another three quarters of an hour or so. A lot more shopping was done by everyone throughout the morning and afternoon, and we left for the airport at 5 p.m.
We had an uneventful journey back, being met at Nairobi as on the outward journey, and at Salisbury where there was a party of Barotse people to greet the Paramount Chief. An R.R.A.F. plane was waiting to take us to Mongu, but after refreshments and dealing with Immigration and Customs the Paramount Chief retired to change his clothes. I had thought that he had gone to put on a thin suit, having left London in a thick one. However, he reappeared in a morning coat with a soft hat and brown shoes. This was the only sartorial solecism committed during the visit, so far as I am aware. We reached Mongu at 1 p.m. and were greeted by an enormous crowd at the airport. Induna Muyunbana had been coughing a good deal and was found to have bronchitis, but the rest of the party were in good order. 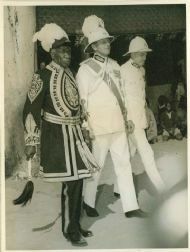 During the whole visit the Paramount Chief had been in remarkably good form, and the respect and honour with which he was treated set him up in his own estimation. Induna Muyumbana was obviously quite out of his depth, suffered from a headache most of the time and cannot have enjoyed his visit. He was quite obviously too old for this expedition. The only other member who was at all unwell was Induna Mukwakwa, who spent one day in bed with fever, but then made a good recovery. I think he also found the visit rather a strain at his age. Induna Katema, relieved of the responsibility of interpreting, looked younger every day. During the talks, to my mind, the outstanding speaker was Suu, and I think he made a very good impression on both sides. Sii-Sii was a thorough nuisance, doing little to help those who were new to England, and being perpetually late. Late on in the visit he did not turn up with the rest of the party and I deliberately left him behind. He duly arrived at the destination and had the impertinence to ask me to pay his taxi fare which I refused to do, pointing out that it was a social occasion and that if he had been present he would only have had to pay 1/-, but as he had to have a taxi by himself it had cost him 4/6d. During the whole visit the Barotse behaved with the utmost dignity and decorum, and there was only one occasion when a small protest was made by the Manager of the Shaftesbury hotel. Induna Muyumbana left the shower on and this was only discovered when water started dripping through the ceiling. This had been pointed out to him by the staff, but the next night he did it again. The Barotse said that the shower was out of order. I am very glad to have the opportunity of addressing this Conference because it gives me the chance of meeting you and to put before you some of my thoughts concerning this Protectorate. When I was wondering the other night what I should talk to you about I found in a book the words that the late Chief Yeta said in 1916 on the occasion of his succession. These words will have been well known to your fathers and your predecessors as school teachers, and I want to remind you of them again today. Chief Yeta said - "Schools are a blessing to the country - send all your children to them. Education and the preaching of the Gospel - therein lies the salvation of the country. Our strength and are salvation are in God." I think that the people in Barotseland must have listened well to those wise words. 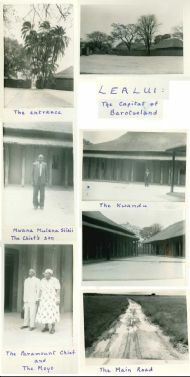 I myself can look back on what Barotseland was like 25 years ago when I first came up here at the end of 1933. At that time it took 17 days to come up the river from Livingstone by barge and after a rest in Mongu I had to walk for 5 days to reach Mankoya. Today, as you all know aeroplanes constantly fly in from Livingstone or Lusaka in a few hours and it is now possible to travel from Lusaka to Mongu by road during much of the year. I am particularly interested in this road because it was during my time at Mankoya that all of it was made and I am hoping that within the next two years it will be a hard, fast, gravel road and that as a result we shall have many more visitors and much more trade with the line of rail. In 1934-1935 when you will remember some of the copper mines had to close down and there was very little work or money in the country, the people in the Mankoya district were wearing bark cloth for clothes and using bark cloth for blankets. I doubt if the people today would be able to make blankets outof bark cloth. 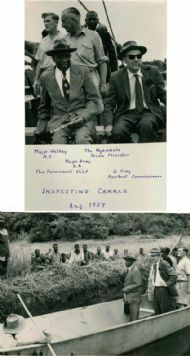 At that time, in the early 30s, there were even then many highly; educated and intelligent Malozi who had been educated in the mission schools and the Barotse National School. That is still the case today and in the six years I spent in the Southern Province in Livingstone not only did I find that most of my best Boma Clerks were Malozi but wherever I went I found Malozi as Medical Orderlies, as Drivers, in the Agricultural, Veterinary and Game Departments, holding responsible positions. This is due to the hard work of you people and your predecessors. The future prosperity of this country is going to depend more than anything else on the wisdom, civilization and intelligence of the people in it, and that in turn depends on the way you teachers teach the younger generation in your schools. You have still got quite a long way to go, but I wonder if all of you appreciate how much progress the African in Northern Rhodesia has made? When I first came to Northern Rhodesia all the lorries in the territory were invariably driven by Europeans, now it is comparatively rare ever to see a European driving a lorry. That is just one small sign of the progress that has been made. Recently a survey has been done of the African Mineworker working on the Copperbelt, and it has been found that fewer Africans leave their work than Europeans and that the turn-over of African labour is one of the lowest anywhere in the world for heavy industry. The average length of service of an African at the mine is 7 years and 600 men have received awards for completing 20 years’ service at either Luanshya or Mufulira. The average African doing a skilled job on these mines receives more than £40 a month which compares with the average skilled worker in Britain, who receives £56 a month. You will be interested to learn that there are more than three million men in Britain who earn less than the average advanced African mineworker - £480 a year. The survey has also found out that 4 out of 5 mineworkers say they intend to retire to their villages and that 9 out of 10 show concern about the proper education of their children and most are willing to pay cash to help their education. One out of every four has a car or a motor cycle, and the average advanced African has five complete outfits of clothing. Two-thirds of them go to Church. The survey contrasts the physically poor specimens of thirty years ago with their bark loin -cloths, who earned 15/- for thirty shifts, with the physically fit African Mineworker of today who earns at least £10.12.6. for thirty shifts. Now this progress over the last thirty years is due to three things. First of all we have been lucky in Northern Rhodesia to have these immense deposits of copper which have brought great wealth into the country. Secondly, if you will allow me to say so you have had the devoted service of the Europeans to help you to make this progress, and thirdly you have had the devoted service of the teachers in Northern Rhodesia, who have sent out from their schools an ever increasingly more highly educated product who is able to take advantage of the conditions of the day and earns ever increasingly higher wages. I expect a few of you will feel jealous of the large amount of money being earned by skilled African mine-workers and I understand that the value of the benefits received by some of them totals more than £70 a month, but you will remember that teachers, like Civil Servants, never expect to make large fortunes but have the great privilege of working for the benefit of mankind and of receiving an adequate wage and a pension at the end of their service - and of course you all know that your salaries have increased over the years and that there is every likelihood that they will go on increasing in the future. Now I want to say a special word or two about conditions in Barotseland. 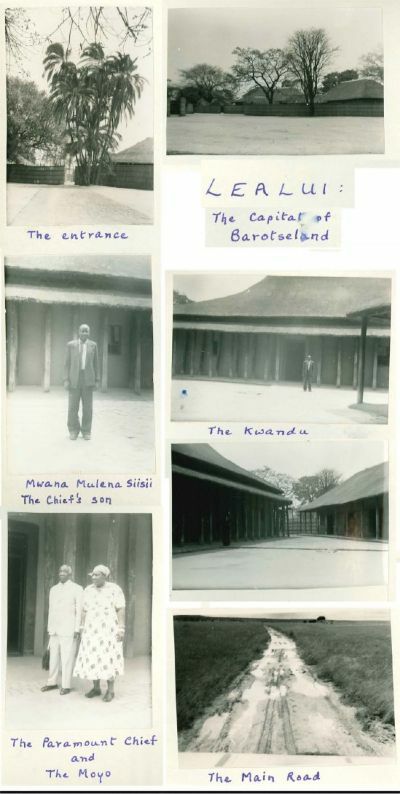 You have always had the great benefit in Barotseland, ever since Europeans first came to it, of wise Paramount Chiefs and of wise Councillors. The wisdom of your Paramount Chief Lewanika has become proverbial, and I myself who have worked with your Paramount Chiefs Yeta, Imwiko and Sir Mwanawina can testify to their wisdom and to the way in which they have always considered the welfare of their people. We are living in difficult times and you hear many exaggerations and lies told. Some of these concern the early Treaties that were made between your Government and that of the Queen of England through the British South Africa Company. While it is true that there were Europeans asking for prospecting rights in Barotseland, it is also true, and you must remember it, that it was your Paramount Chief Lewanika and his Council who first asked for a Treaty with the Queen's Government in England. This Treaty was asked for because the people in Barotseland were suffering from a constant series of internal wars. They had constantly to be on their guard against raids by the very strong Matabele tribe in the south, and they were becoming more and more perturbed by the encroachment of the Portuguese in the north and west, I believe myself that if any of you read all the papers concerning the Treaties and the Records of the Treaties, many of which are published in books, you would find that those Treaties had been scrupulously kept by the British South Africa Company and by the British Government and that you had benefitted enormously by them. These Concessions were in some degree contracts and both sides gained something by giving something else. 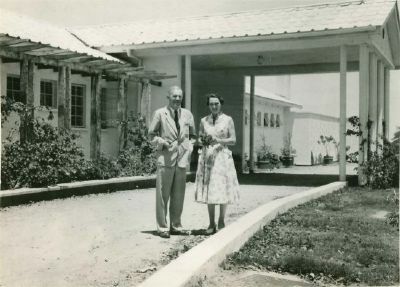 The British South Africa Company gained mineral right and the disposal of certain lands to European farmers outside the present boundaries of Barotseland.. On the other hand, Barotseland gained the protection of the Crown and there have been no internal troubles in Barotseland in the last sixty years, nor have there been any further troubles with the Matabele nor, since the King of Italy's award, over-encroachment by the Portuguese. It is difficult perhaps for you people here today to realise what immense benefit that has been to your country, but you will, I know, appreciate that within the bounds of the present Barotseland Protectorate there is no land which has been alienated to Europeans and you have repeatedly and very recently had your Treaty Rights confirmed by the Secretary of State. In these political times everyone is always anxious about the future, every where in the world, but I think you have less cause for anxiety than most people, and so long as you continue to have a wise Paramount Chief and wise Councillors I am certain that you can look forward to the future with the greatest confidence. It is very essential that you yourselves should know more than I think you do know about the Concessions and Treaties, and that the children in the upper classes of your schools should know about them too. It is also essential that all the children in Barotseland should be brought up to pay the old-fashioned Barotse respect to their elders and betters but particularly to the Barotse Native Government. They must appreciate that that Government is working extremely hard all the time with many and increasingly difficult problems and that they need and deserve the fullest possible support of all the peoples in this Protectorate. Lastly, I want you to understand the position of the European Civil Servant in Barotseland. I myself as Resident Commissioner regard myself as the adviser to the Paramount Chief and his Government, and you will, no doubt, know that I visit the Paramount Chief at either Limulunga or at Lealui at least once a week for discussions. The Technical Officers in the Protectorate are here solely to do everything they can to help the people and they do this by working with the Kuta Induna. who is responsible for their particular subject. That is, the Provincial Agricultural Officer works hand in hand with the Protectorate Agricultural Induna, and so on with all departments. The sole aim and object of the Technical Advisers in the Protectorate is to bring you the best technical advice on the subject. We all of us know that if we try ourselves to put across to the ordinary villager the best way of managing his crops or his cattle the villager will take very little notice unless that advice is supported by the Paramount Chief and his Government. In the same way the Kuta Induna is able to put across the views of the Barotse Government to the people but he has not got the technical knowledge to be able to give the best advice. We can only therefore get progress if we all work together, that is if the Protectorate Induna and the Provincial Officer work constantly together with the same object in view and with complete confidence in each other. I am glad to say that relations between the Barotse Native Government and the European Technical Officers are most cordial, and I hope that this may long continue. Please see that your pupils understand this position and are brought up with the determination to acquire higher scales of civilisation and to be proud of the Protectorate in which they live and determined to do all that they can for its future happiness and prosperity. Finally, I would remind you again of the late Paramount Chief Yeta’s words:- " Education and the preaching of the Gospel - therein lies the salvation of the country."